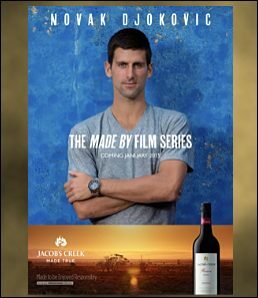 World number one tennis player and three-time consecutive Australian Open winner, Novak Djokovic, is partnering Australian wine brand Jacob’s Creek in the production of a short film series, called ‘Made By’. In his debut for the brand, the Made By films show Djokovic humbly revealing never before told stories about his life. Shot in documentary style on location in his home town of Belgrade, Serbia, the films celebrate the people, places and passions that have made Djokovic the tennis champion he is today. Directed by emerging US film maker Keith ‘Keef’ Ehrlich, the series takes viewers back to the beginning of Novak’s journey from war torn Serbia, to the dedication of his first coach Jelena Gencic and his pivotal grand slam wins at the Australian Open and Wimbledon. The films are the next evolution of the successful Jacob’s Creek ‘open film series’ starring tennis legend Andre Agassi. The films will be launched globally on January 13, 2015. The partnership with Djokovic is part of the Jacob’s Creek global tennis sponsorship platform, which includes the Australian Open, Wimbledon and the China Open. The Made By film series is an element of the new Jacob’s Creek ‘Made By’ global campaign, which launched in November 2014.